Unfortunately time constraints (i.e my day job) keep getting in the way of me updating this site so all Ive been able to do so far for the Millwall Nickname page is a very basic bit of background. 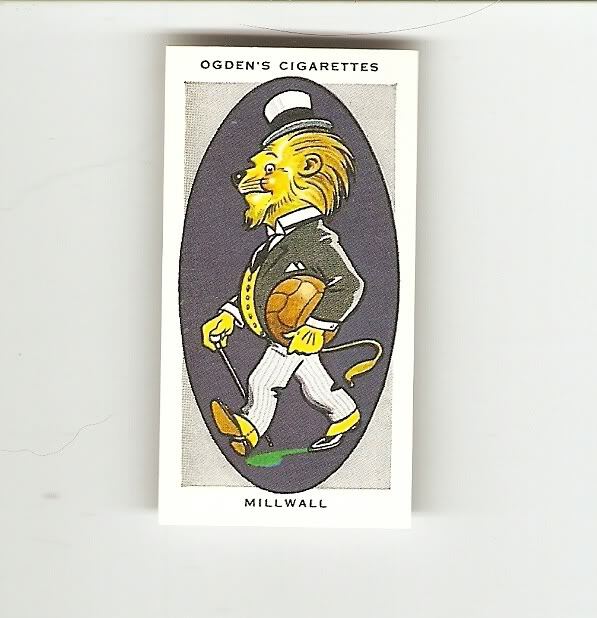 Ive shown below a football cigarette card from the Ogdens AFC Nicknames series that shows a Lion with a football which of course depicts Millwalls "Lions" nickname !! "The fighting name, the “Lions” has always seemed an appropriate one for Millwall. The crest of the club is a lion rampant, and from that the nickname was derived. Given them in their early days at the Isle of Dogs. It still survives now that they play at New Cross, moreover, their ground continues to be called the “Den”. Members of the old Southern League, they gained promotion to the Second Division in 1928. Millwall has always been a most popular London club despite its unsatisfied ambition to attain senior rank. W. McCracken, the master of the off-side trick in his days with Newcastle United, is now the manager.". So there you are, a very brief overview of Millwalls Lions nickname, theres a bit to expand on yet though so I will come back to this page shortly.